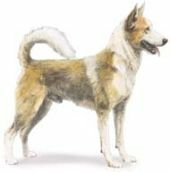 Canaan Dog Breed | Herding Dog Breeds | National Dog of Israel. Was He Queen Jezebel's Companion? The Canaan dog breed is widely recognized as the national dog of Israel and has been known in the middle east for centuries. While he is a descendant of the wild Pariah Dogs, many dogs from this group became somewhat domesticated in early times by working as flock guardians and herders to nomadic tribes such as the Bedouins. Dr. Rudolphina Menzei of Israel was an ardent admirer of the Pariah dogs, to the point that she decided to develop a pure bred line from their stock. What resulted was the Canaan dog breed we know today and for which she is mostly credited for bringing about. This dog is of medium size, well-proportioned and squarely built. He has an athletic appearance which compliments his characteristic sharp fast trot. He has a wedge-shaped head with erect low set ears and a smooth coat that finishes with a bushy tail. He is assigned to the herding dog breeds of the AKC. The Canaans' abilities have earned them recognition in conformation, herding, tracking, obedience and agility. An interesting legend about the Canaan dog suggests that this breed was tethered to the throne of Queen Jezebel by a golden chain. The Canaan Dog is a very good family companion. He is cautious and reserved around strangers - a carry-over from his feral beginnings when he had to be ever vigilant of his surroundings. But as a family companion he is extremely loving and loyal. His hearing and scenting abilities are fantastic and this coupled with a very alert disposition, makes him an excellent and protective watchdog. However because of his natural reserve and suspicious nature, it is wise to thoroughly socialize your Canaan from an early age, to help him learn how to recognize and evaluate various situations, people and other dogs. Canaan Dogs are very intelligent and train easily if the right approach is used. Owners report that harshness will get you nowhere! On the other hand, motivation in the form of praise or treats as rewards, works wonders and will help your dog remember his lessons much better. Another tip is to keep training sessions short and as creative as possible, so as not to bore this smart dog. But the "biggie" in the training department, is getting your dog's respect as his pack leader and showing confidence when working with him. House training generally takes less time to accomplish with this breed because he has stronger ties to the "den" mentality and is more naturally clean. Ideal standard weight: 35-55 lbs. Colors: Sand to red-brown, white and black, with or without masks. The Canaan has a flat lying double coat that is medium short, and straight. The tail is bushy and curls over the back. The Canaan does not require an excessive amount of exercise, but he does need regular daily walks to maintain good health of mind and body. In addition, a dog with some former feral traits, will definitely appreciate an opportunity to play and run freely if a safe area to do this is available. Next best thing would at least be a yard where the dog can be engaged in games to challenge his intelligence. Canaans have done well in the competition in the areas of tracking and agility, so this is something else you might want to consider to take advantage of his athletic talents, as well as for his enjoyment. Ideally, this breed is best suited to a house with yard space sufficient enough for outdoor play and exercise. When raised with children and other pets, the Canaan Dog has a good reputation and is considered a gentle companion. However, it is still always the best policy in our mind to have an adult supervise activities between pets and children. The devoted and loyal nature of this dog, would make it a good companion and protector for the elderly providing it has some outlet for regular exercise. A fun book about the personality connections between people and their dogs. Has some interesting insights about life too! You'll know even more about your dog friends and yourself after reading this enjoyable book written in a delightful style. 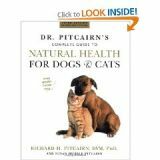 Dr. Pitcairn's book is one of the most trusted references for natural pet health care. Anyone who is interested in the holistic approach to natural healing as well as chemical-free nutrition for their pets will find this book invaluable.